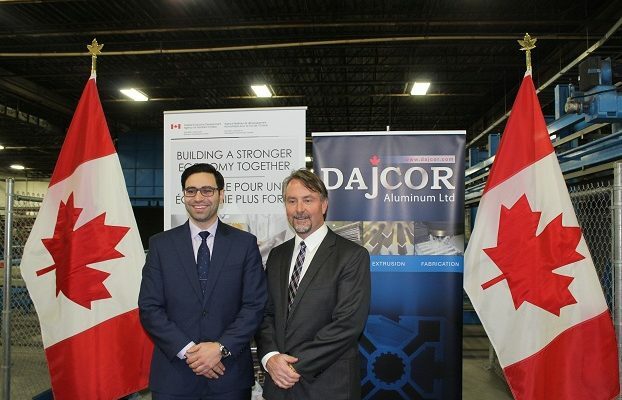 December 28, 2016 - "Press Releases"
The federal government is investing $2.48-million into Dajcor Aluminum Ltd. in Chatham. The funding announcement had been made Monday morning at the Dajcor facility. The investment from FedDev Ontario (Federal Economic Development Agency for Southern Ontario) is primarily to increase production — meaning more job opportunities and upgrading the facility. London Liberal MP Peter Fragiskatos came to Chatham, where he was taken on a tour of the facility. During the tour he had been accompanied by Dajcor President Mike Kilby and the Chatham-Kent Mayor Randy Hope. The manufacturing company provides aluminum components for many sectors including automotive, light rail transit, and construction. Fragiskatos says the investment FedDev Ontario is making doesn’t just help support Dajcor, but the manufacturing industry as a whole. He adds, an important part of manufacturing is to stay innovative. Dajcor Aluminum has also recently received provincial funding. The combined funds will be allocated to different areas, with more noticeable changes coming in the new year.